These are truly pretty! They look very soft, too. Did you have fun knitting them? thank you so much! I love the color. 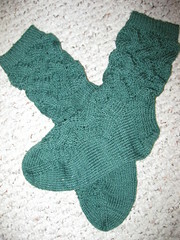 and they were fun to knit, almost monkey-ish.